Big Brothers Big Sisters joins Berg Adventures again on our unforgettable Deluxe Khumbu and Everest Base Camp Trek. Big Brothers Big Sisters is an organization that provides mentoring programs across Canada. With the help of volunteers, they are able to help find mentors for young children who can greatly benefit from having a role model. 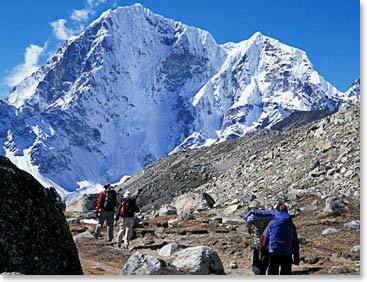 This trek through the Khumbu remains, in our opinion, to be one of the most fantastic and memorable trips that we offer. As we trek through the most spectacular mountain ranges we will immerse ourselves in history, art and religion of one of the most fascinating cultures in the world. This is truly a pilgrimage that any lover of the mountain world will consider the opportunity of a lifetime.